REAL IS DEFINED AS actually existing as a thing or occurring in fact; not imagined or supposed according to Webster’s Dictionary. This was also something of a favorite phrase a contemporary of mine used back when I was in college. As a matter of practicality, getting real means avoiding the opposite which is fantasy or simply not real. Reality has different meanings for all of us as it applies to what is going on in our lives. Perhaps a child or grandchild was born, or were recently retired or a new job was secured. Something unique that impacts us may give us joy or sorrow. The one thing that I have learned over the years, is time takes care of everything. I have attached a poem written a long time ago, which I believe sums up some very good advice for daily living. 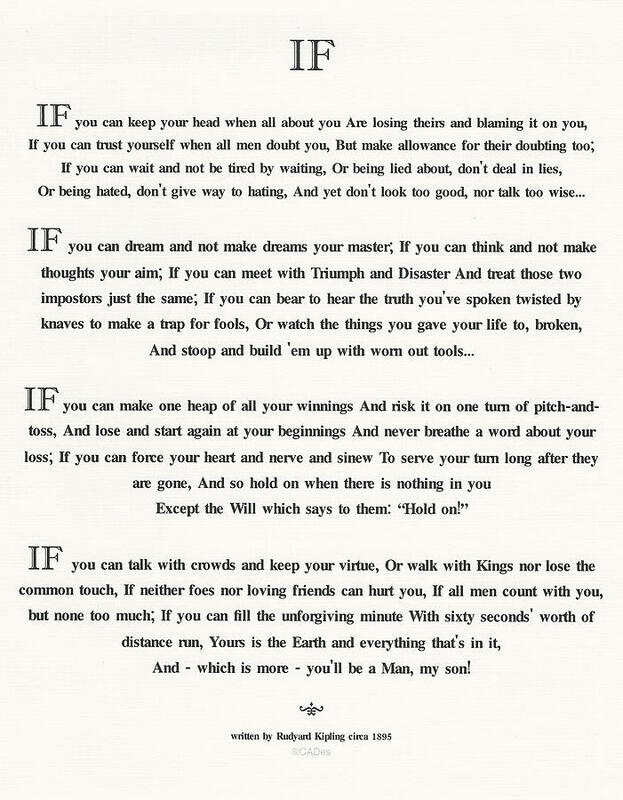 It comes from Rudyard Kipling. I hope you enjoy it. Remember we are here for you in good times and bad. Please reach out to us as we are here to help. The opinions voiced in this material are for general information only and are not intended to provide specific advice or recommendations for any individual. For Social based investing: The return may be lower than if the adviser made decisions based solely on investment considerations. All investing involves risk including loss of principal. No strategy assures success or protects against loss. There is no guarantee that a diversified portfolio will enhance overall returns or outperform a non-diversified portfolio. Diversification does not protect against market risk. Past performance is no guarantee of future results. TO CATCH UP ON PREVIOUS POSTS PLEASE CHECK OUT THE NOTE SECTION OF OUR FACEBOOK PAGE. SIMPLY CLICK HERE. HOPE TO HEAR FROM YOU SOON! ?